Siliguri, 12 July: PRESIDENT Pranab Mukherjee today called upon the countrymen to maintain unity and integrity of the nation. 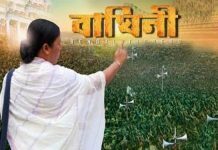 Terming Darjeeling “Mini-India” he said:“Darjeeling has its own culture and history but it has always served as a melting pot of diverse cultures and ethnicities as the people of Darjeeling have chosen to live together and work together”. As part of his three day visit to the Queen of Hills, Mukherjee had arrived in the hilly township today afternoon. He was felicitated by the state government in a public reception at Chowrasta in Darjeeling, also known as Mall, in the presence of Bengal Governor Keshari Nath Tripathi, Chief Minister Mamata Banerjee, Gorkha Territorial Administration (GTA) chief executive Bimal Gurung, ministers Arup Biswas, Gautam Deb, and Indranil Sen and host of other dignitaries. 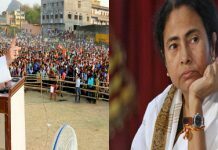 Mukherjee lauded Bengal Chief Minister for the development works in the hills. He also took time to thank local residents who had gathered in large numbers to witness the ceremony despite rain and low temperature. “I am touched by your warmth and I have not come as a guest here but as one of you,” he said. 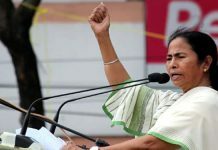 In her address, the Bengal CM also said that Darjeeling would continue to remain a part of West Bengal despite the demand for a separate statehood by some of local leaders and groups. Earlier, during the programme, Gurung on behalf of the GTA presented the dignitaries with busts of Lord Buddha. The President will preside over the birth anniversary celebrations of Nepali poet Bhanubhakta Acharya tomorrow and also attend the annual general meeting of Darjeeling Tea Association on Thursday before returning to Delhi.